Dental decay is the most common chronic illness in children and can have a major impact on the child’s health and overall quality of life. Although they do fall out, baby teeth (aka milk teeth or deciduous teeth) play an important role in helping children eat, speak clearly, develop confidence and also guide the permanent teeth into the correct position. 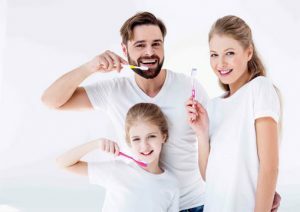 Children follow by example, so having a parent who takes care of their teeth sends a valuable message that oral health is to be valued. Flossing is an additional step that must be introduced- there is no minimum age where flossing is advised, but sooner the better! Once the child is comfortable with flossing regularly, this habit will often continue into adulthood preventing dental issues with their permanent teeth. A child should have been exposed to a dental setting ideally prior to their first birthday- and slowly check ups and cleans can be undergone with time and with the child feeling more comfortable with their dentist. 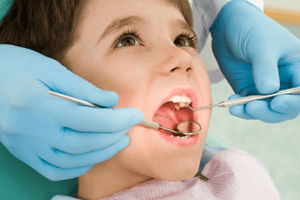 Regular attendance from a young age to the dentist will assist in preventing development of any dental anxiety and will allow the dentist to identify any issues at a young age. Issues can include decay, bite problems, airway blockages, skeletal growth problems of the maxilla and mandible and any future crowding/spacing issues that may require early orthodontic intervention. Diet is a major culprit in the development of dental decay- frequent snacking on sugary and starchy foods are feeding the bacteria in dental plaque which then develops into cavities. Fluoride is one of the best ways to prevent tooth decay. Fluoride is a naturally occurring mineral and it actually combines with the tooth’s enamel to strengthen it. Most areas in Canberra luckily have fluoridated water, and using a normal over the counter fluoride toothpaste is sufficient protection against dental decay. For children at high risk of dental decay and without access to fluoridated water, additional fluoride supplements may be advised. 0 to 12 months; Do not put a baby to sleep with a bottle. Pooling of milk around the teeth overnight can lead to decay. Start cleaning teeth as soon as they appear. Use a small soft toothbrush with water (no toothpaste). Try to introduce drinking from a cup at 6 months. 12 to 18 months; Brush their teeth with water twice a day (no toothpaste) After 12 months children should be drinking from a cup. 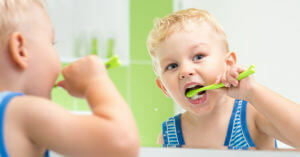 18 months to 5 years; At 18 months start using a pea sized smear of low fluoride toothpaste, assist children with brushing their teeth twice a day until they are eight years old. By 2 years of age a child should have an oral health check, this can be done by the maternal and child health nurse, family GP or dentist. For all children; Fruit juice and fruit drinks are not recommended for infants under 12 months. Give fresh fruit instead of fruit juice. Chewing stimulates saliva which protects teeth against decay. Water and milk are the best drinks. (Full cream milk for children under 2 years of age; Low fat milk can be given to children 2 years and over) Limit sugary drinks including: soft drinks, fruit juice, sports drinks, vitamin waters, cordials, fruit drinks and energy drinks between meals. Limit processed foods and foods high in sugar.